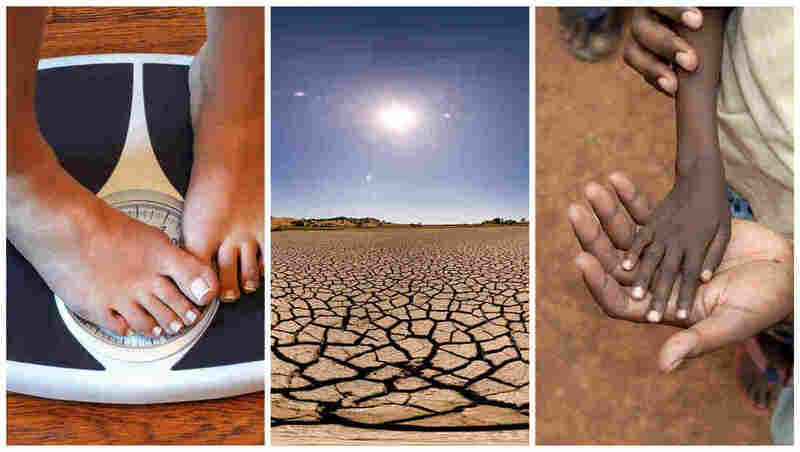 Study Calls Obesity, Climate Change And Undernutrition A 'Syndemic." What's A Syndemic? : Goats and Soda A new report in 'The Lancet' uses a not-too-familiar term to describe looming global problems that appear to be interconnected. A new study points to the connections between climate change, lack of proper nutrition and obesity. The Lancet Commission on Obesity has announced that the world is suffering from a "syndemic" of obesity, undernutrition and climate change. But ... what, exactly, is a syndemic? The term was first coined in the 1990s to describe the way different diseases interact within the human body. It's popped up in medical journals for the last two decades, often used to describe the biological interactions in patients who have AIDS and are substance abusers. Now, a new report by the Lancet Commission is broadening the definition big time, using it make a connection between three of the biggest public health issues of the 21st century. "We just chanced on it — I didn't know what a syndemic was," says William Dietz, a co-chair of the commission and director of George Washington University's Global Center for Prevention and Wellness. But upon diving into the literature, he found it to be "a very convenient, unifying concept." Looking at these trio of issues in isolation, he says, just isn't working. The report emphasizes that the issues are indeed linked. Climate change results in severe droughts, which can lead to a scarcity of food as well as higher prices for available fruits and vegetables. That pushes consumers toward processed foods, which are cheaper — and can contribute to a lack of proper nutrition. And farming definitely has a carbon footprint. Dietz is concerned about the lack of progress in addressing each concern. "The climate change silo and the obesity silo haven't been effective," he says, noting that global temperatures are on the rise, and no country has been able to successfully reverse its obesity epidemic. Two billion people suffer from a deficiency of vitamins, minerals and other micronutrients, according to the report. If the problems are linked as part of a "global syndemic," Dietz hopes it will "increase the likelihood" that groups dedicated to one of the three issues will begin to work together. But the man who came up with the term "syndemic" doesn't think the Lancet's use is in line with his intentions. In fact, he doesn't even think they're using the term "epidemic" correctly. "First of all, they refer to climate change itself as an epidemic, which is a kind of a loose use of terms," says Merrill Singer, a professor of anthropology at the University of Connecticut. The definition of syndemic relies on diseases interacting within the body, he says. Climate change, undernutrition and obesity, he says, don't tend to interact on that biological level. "It really isn't comparable to a syndemic if you adhere to a strict definition guideline," he says. Nonetheless, he appreciates the commission's decision to address the interconnected causes of obesity, climate change and undernutrition. "In a big picture way, I clearly support what they're doing." Others agree that, whatever you call it, the idea of linking the three problems has potential. Bruce Y. Lee, executive director of John Hopkins Global Obesity Prevention Center, says he is pleased to see the commission tackling obesity as part of a wider net of global dysfunction. "Too often, we think of these problems as separate," he says. In reality, he often finds that people who are obese are also deprived of crucial nutrients. "We're seeing a new phenomenon where populations and people are facing undernutrition as well as overnutrition," he says. "You're seeing a change in body shape" where people "have very skinny arms and limbs but central obesity." Much of this, Lee says, is due to the fact that junk food and sugary drinks are cheap — and abundant. The food and beverage industries have spent $22.3 million on lobbying to keep it that way. California lawmakers recently promised a 12-year moratorium on soda taxes after the industry funneled $7 million dollars to try and stop them. "This is a systems problem," says Lee. With this report, he says, "these systems are starting to get called out." The report recommends a series of actions that the authors hope could act in concert to address the problems. Chief among them is a worldwide treaty to regulate Big Food like Big Tobacco, limiting the political influence of the food and beverage industry. It would be modeled on the World Health Organization's Framework Convention on Tobacco Control, the world's first public health treaty. The report also suggests a tax on red meat, which is associated with an increased risk of obesity and greenhouse gas emissions. When asked during a press conference what the authors' dream timeline would be to enact the report's recommendations, commission members said it was too hard to tell. "Oh my goodness, that's a very difficult question," Deitz responded. The report, he says, is meant to act as a conversation starter. But it will be up to businesses and politicians to bring the recommendations to fruition. "We're under no illusion that this is going to be quick," says Dietz. "I just hope that it's quick enough."